After a blissful night’s sleep, we woke up in time to pack up and check out before our last tour of Iceland. With such a short trip we couldn’t go far into the country, but we wanted to see as many highlights as we could. 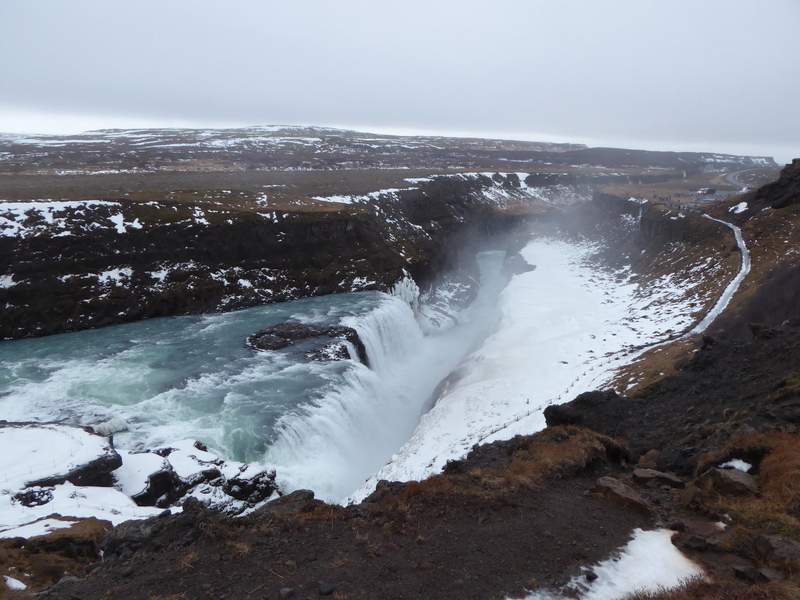 One of the main draws of the western part of Iceland is the Golden Circle, a full-day loop of natural wonders. 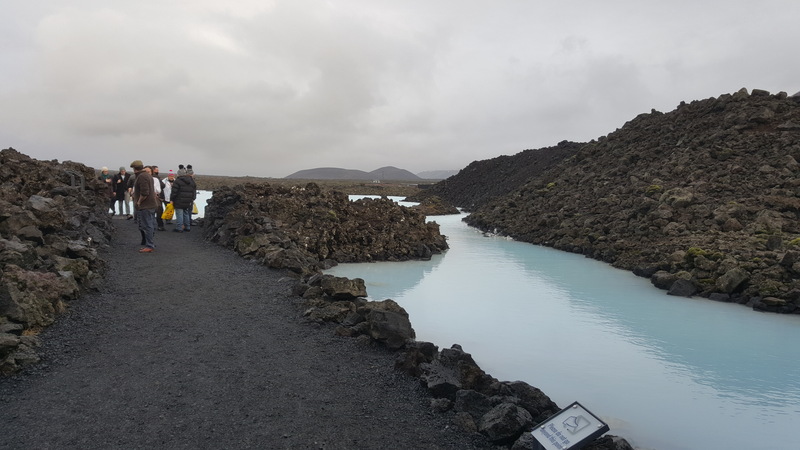 Iceland is one of the youngest countries on Earth, geologically-speaking. 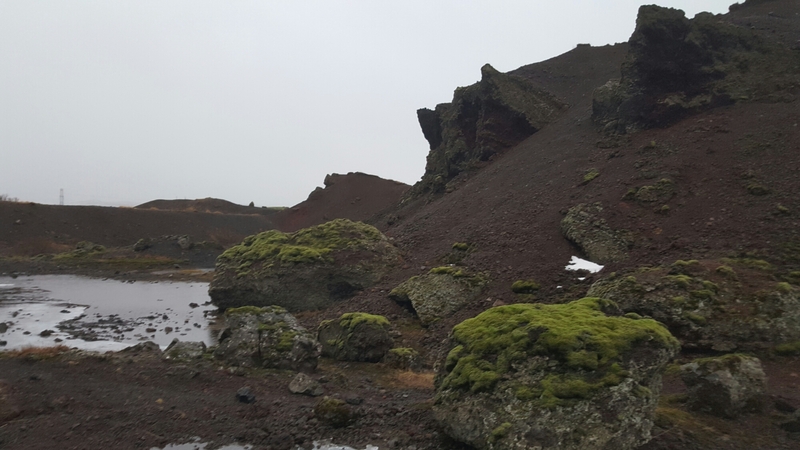 It thrust up from the sea floor as the North American and Eurasian plates pulled apart, and the island is dotted with volcanoes and geothermal hotspots. Iceland harnesses this geothermal energy to produce electricity and provide hot water; I love how eco-friendly it is, but our guide admitted that with no trees or coal or oil Iceland really had no other options. The only problem was that the natural hot water coming from the taps came with a price — it smelled like rotten eggs from all the sulfur! Tasted fine, though. Anyway, with all this geological activity going on there is plenty to see in Iceland. Our guide Baldwin (yes, like Alec) pulled up in a minibus fitted with nail-studded winter tires. We were one of the last to be picked up, and all the others were too shy to sit up front. We gladly took the front two seats as they gave us a better view. We drove out of Reykjavik and onto Route 1, the main road that rings Iceland. The sky was cloudy but thankfully the rain had finally stopped and even in the darkness we could see for miles. An hour into the drive a few clouds began to turn red as the sun peeked through. Baldwin told us that now the days were 5 hours long, which seemed an eternity after the 3 hours and 45 minutes of daylight at the winter solstice a month ago. Baldwin was extremely knowledgeable and throughout the drive he would point out interesting features and share bits of trivia with us. His voice through the headset microphone sounded rehearsed — I thought he was going off a script until he answered spontaneous questions in the same straightforward, unhesitating way. I realized that was just the way he talked. Just like his namesake! We had a quick pitstop along the way for coffee and to stretch our legs. Both I and my fitbit appreciated that Baldwin stopped at least every 45 minutes for a little walk. 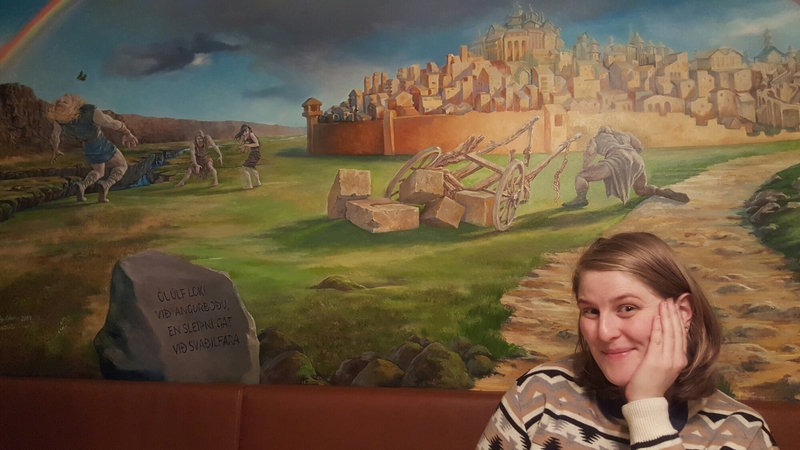 This particular cafe was in a shopping centre that was built in the town of Hveragerði. The mall was originally supposed to be 4 storeys high but the massive earthquake in 2008 put the kibosh on that plan. Four floors were revised to just one, and they decided to turn the huge crack that opened in the bedrock into a little tourist attraction. There was a little shack you could pay $2 to enter for a “quake simulator” but we decided to pass. 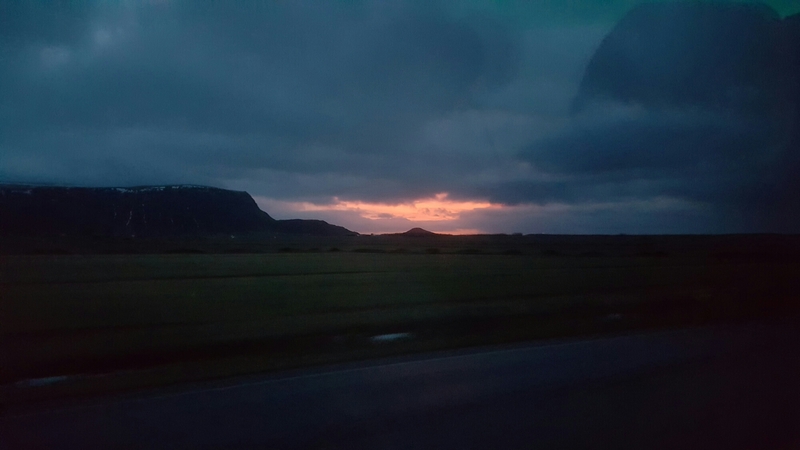 A few minutes down the road we passed the tiny town of Selfoss. 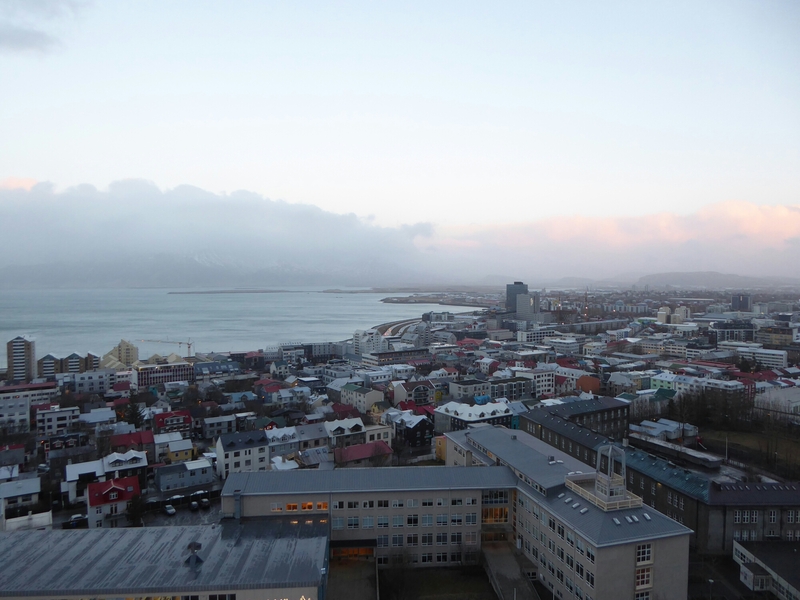 Although only six thousand people live there, it’s still the 8th biggest city in Iceland. Baldwin told us that a very famous person is buried in the cemetery there: Bobby Fischer. I wished we’d been able to stop to see the grave but we had to beat the huge busses to the tour stops. Apparently Fischer left the US in the 1990s when the government came after him for tax evasion, and he lived in various places around the world. In 2004 he was arrested by the Japanese government for using a revoked US passport. He had made many friends in Iceland, especially because of the 1972 World Championship he played there (as it was a neutral spot during the Cold War). 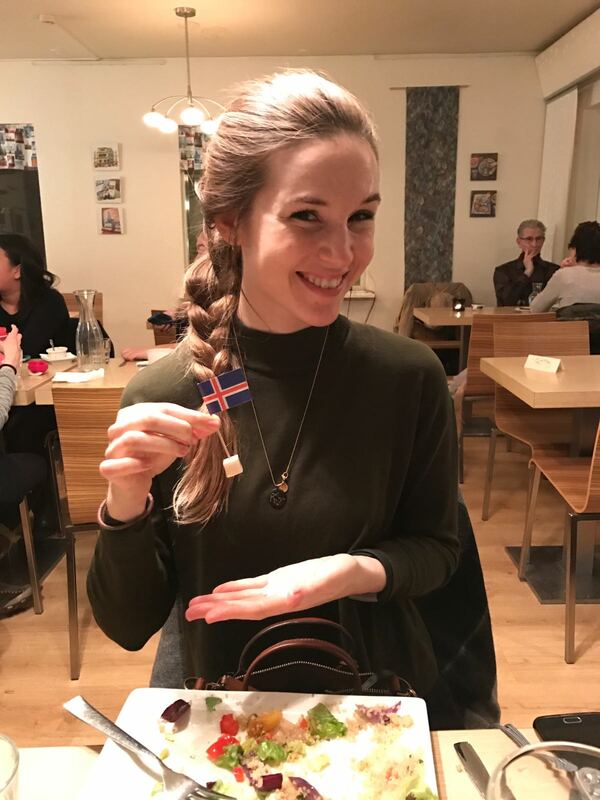 His friends in the Icelandic government heard about his predicament and instantly granted him citizenship and an Icelandic passport, allowing him to leave Japan and live in Iceland until his death in 2008. We came to our first stop a little while later, the Faxa Waterfall. It was beautiful in the sunrise, and the crampons Baldwin gave us allowed us to navigate the icy walkway to the viewing platform. Next to the waterfall was a manmade salmon ladder, something I had never seen outside of a 60s documentary. Baldwin also kindly pointed out a sheep-sorting facility nearby. Three times. He was sometimes a bit too informative. Baldwin told us this was nothing compared to our next waterfall, so we hustled back into the minibus. He was right. 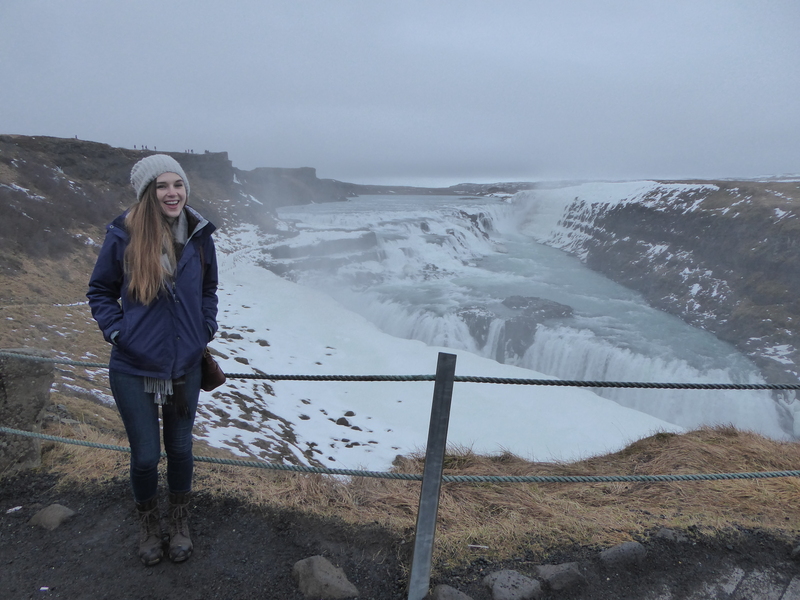 Our next stop was Gullfoss, or Golden Falls. It was two falls stacked on top of one another at a right angle, and the spray from the falls filled the canyon with ice. 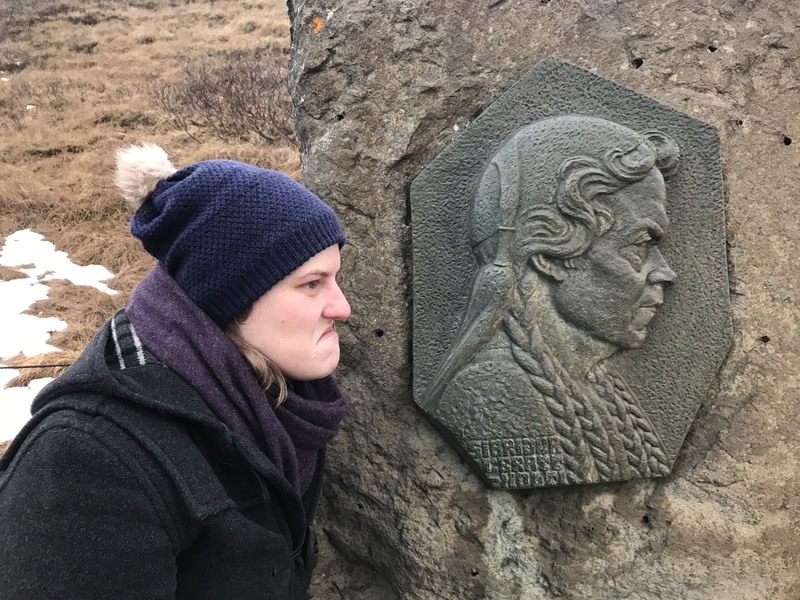 I was impressed that the ever-progressive Iceland had put up a memorial to Sigridur Tomasdóttir, a woman who championed the protection of the falls and who was Iceland’s first environmentalist. You’d think they’d pick a better picture of her, though! 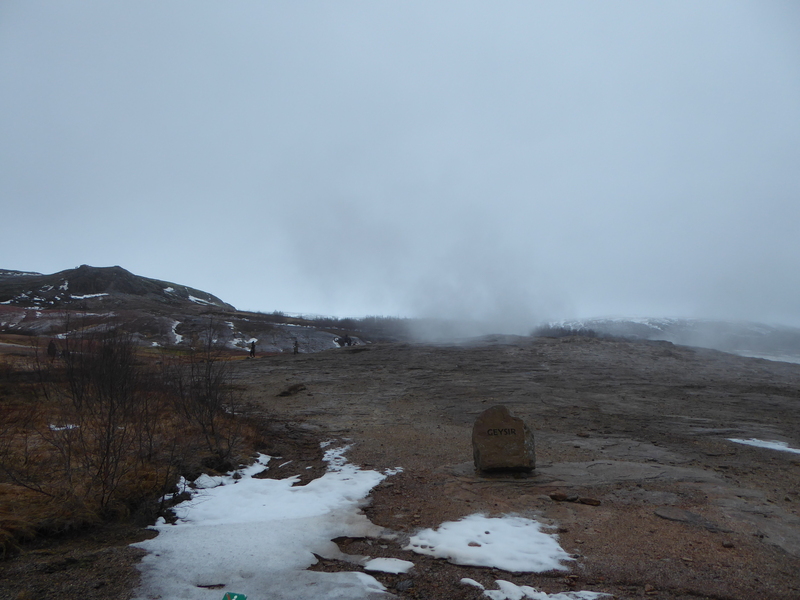 We stopped for lunch in Geysir. You can probably guess from the name what it’s famous for. 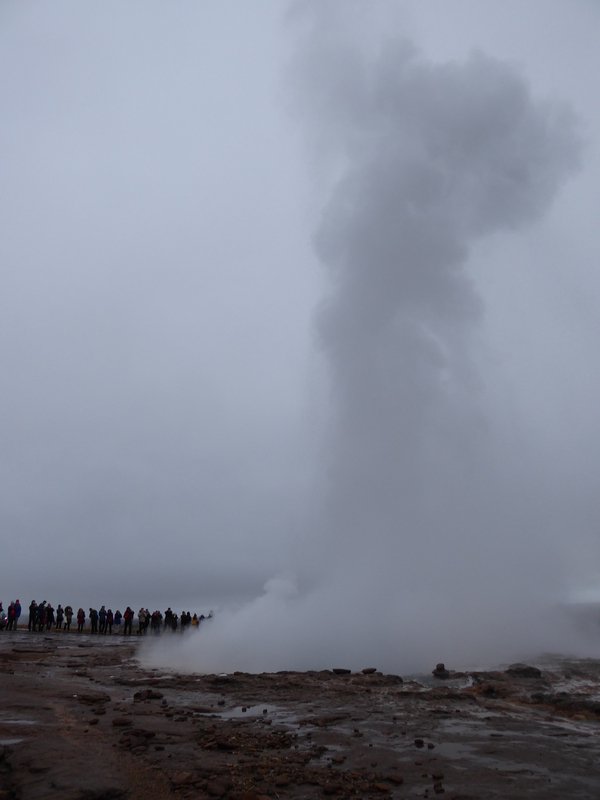 Apparently the word “geyser” comes from this place, as it was once the only known location for this phenomenon. There were marked paths to walk on to avoid falling into boiling mud pits that could open up anywhere. At first we were disdainful of the tourists Baldwin told us about who foolishly went off the paths and ended up seriously injured. After walking around ourselves, though, we saw how unclear the walkways were and had a bit more sympathy for the people who got cooked. A light rain was falling and I was grateful for my waterproof jacket. 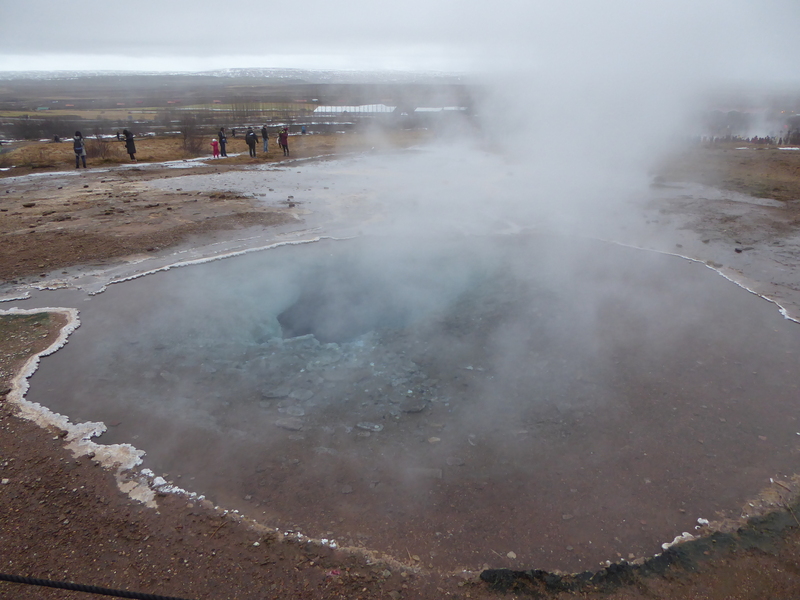 There were little bubbling pools everywhere and plumes of sulphuric steam blew across the fields. 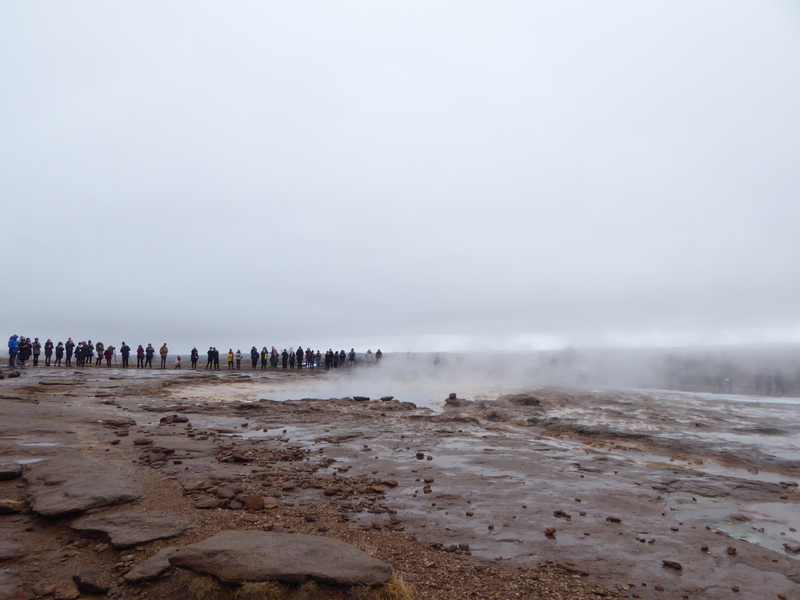 We gingerly picked our way over streams of water flowed alongside and over the paths and walked up to the geyser. 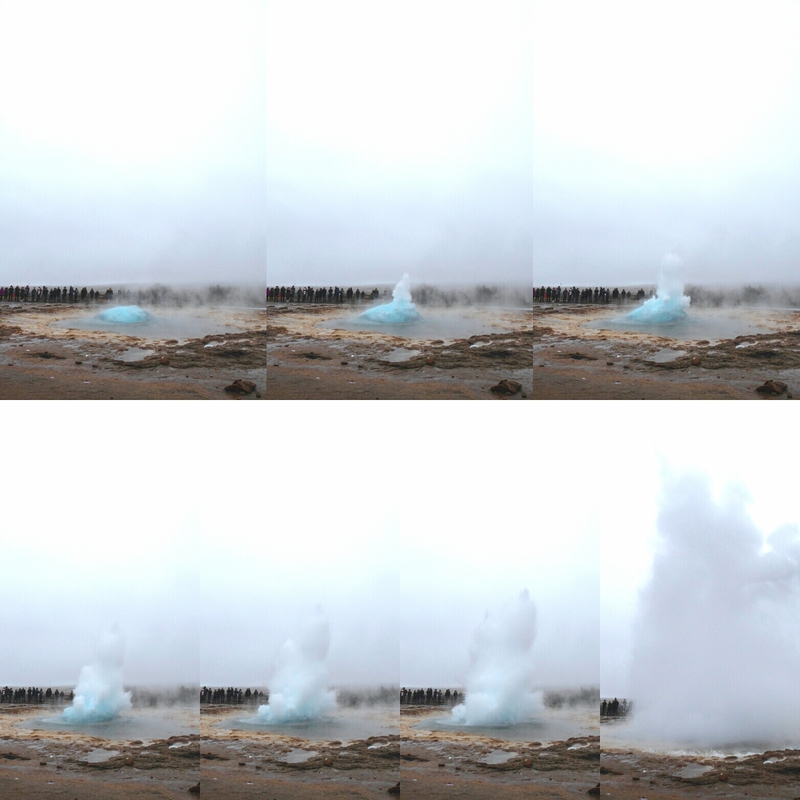 I’d never seen a geyser in person and it was spectacular! It shoots off every 5 minutes or so, and the water can go 200 feet in the air or more! We watched a couple eruptions, had lunch, then came back to catch another one. It made me want to see Old Faithful in Yellowstone! The advantage of such a small tour group was that we could stop (or not) whenever we wanted. 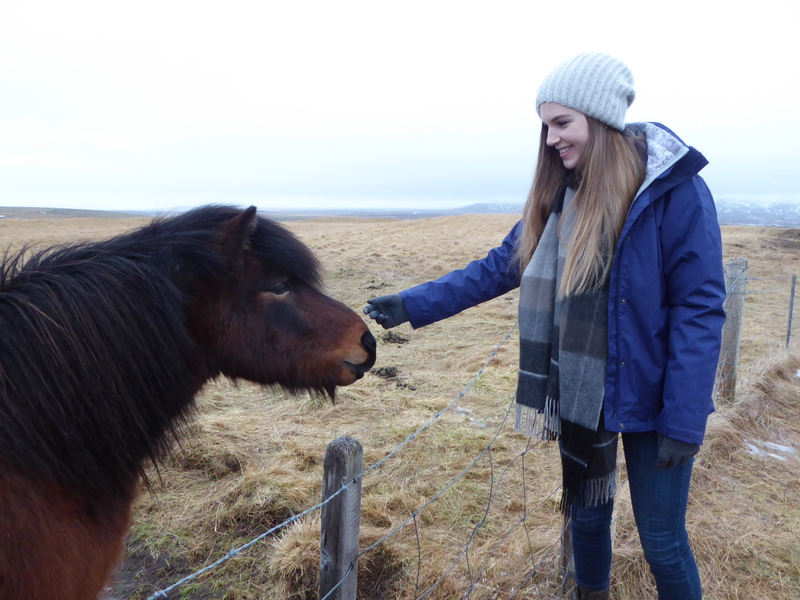 Not long after we left Geysir we stopped again to pet some more friendly Icelandic horses! On the way to our last stop the van climbed higher and higher into the mountains. As the elevation increased the spitting rain turned to snow, and we stopped for a stretch and a few pictures. 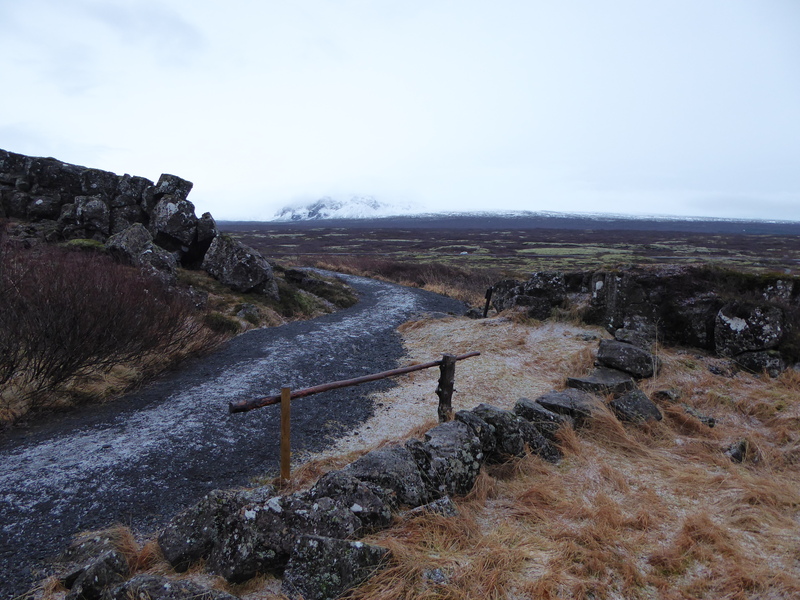 Our last stop of the day was Thingvellir National Park. It’s famous not only for its strange beauty, but also for being the site of the world’s oldest parliament. The Althing (Icelandic Parliament) started meeting at the lush valley where the two continental plates pulled apart in the year 930. 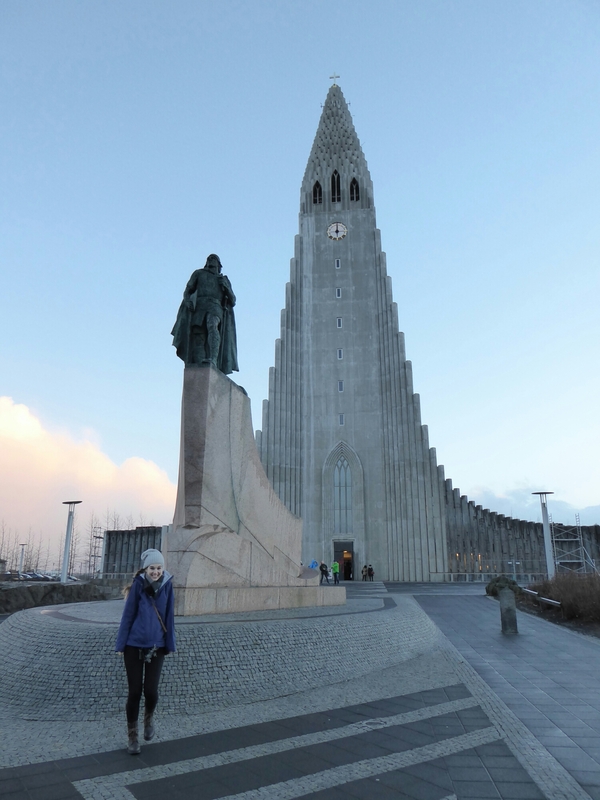 At the time it was made up of provincial chieftains, but representatives continued to meet there every summer until 1799, when they decided to move the Althing to Reykjavik, not least because an earthquake had ripped the place apart even further. They did the usual Parliamentary things of creating laws and discussing issues, but they also conducted executions here. It was difficult to execute someone in winter as the ground was frozen too solid to bury them. Now I’m back in Edinburgh for a week before I go down to London and then head home to sunny Melbourne! ​Yawning, we clambered onto the minibus that would take us to the horse ranch. 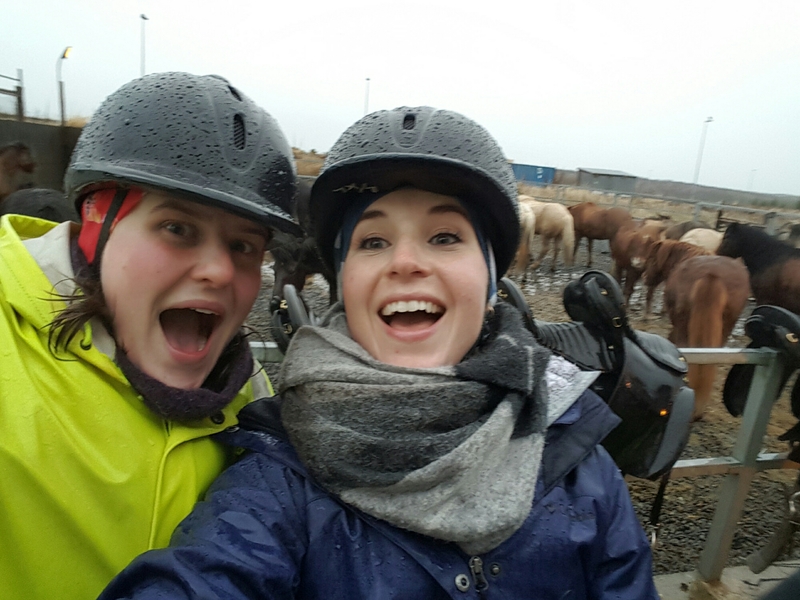 It was still freezing and pouring rain, but all the same we were excited to experience a ride on Icelandic horses! The farm wasn’t far outside Reykjavik and we got there while it was still dark outside. It turned out that our driver was the husband of the owner and guide, Begga (pronounced like Becca). She alone was worth the visit. She looked strong enough to tackle any horse, and her smile and enthusiasm brightened up a dark morning. 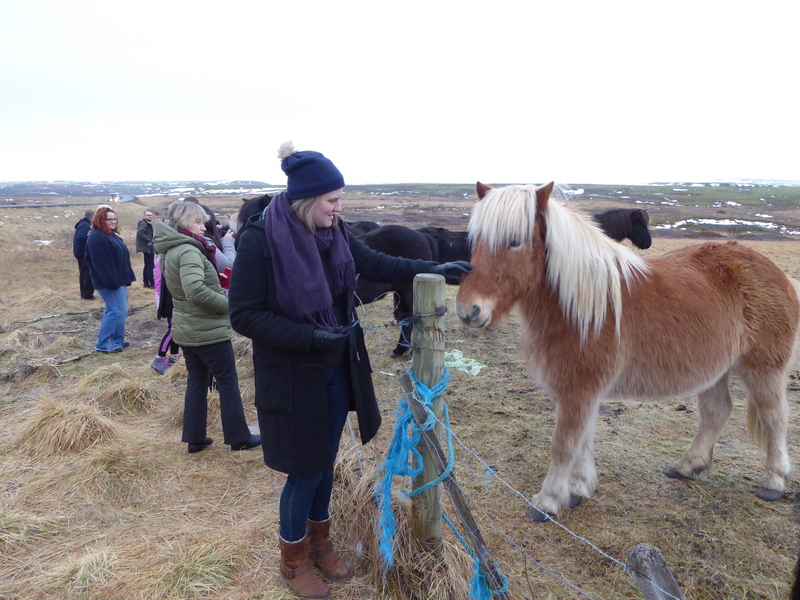 She explained that Icelandic horses are special not only for their small stature and furry appearance, but also for a special gait called the tölt that allows them to smoothly trot across the rocky landscape. 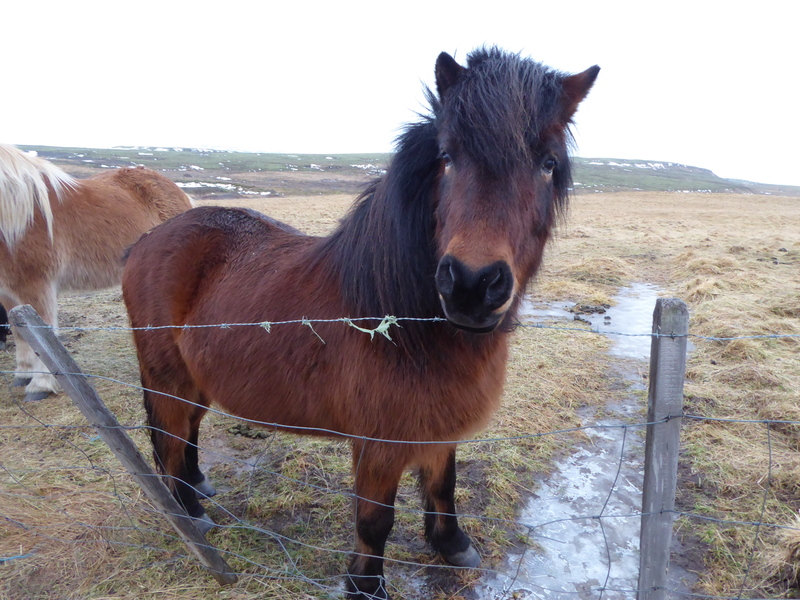 After gearing up with helmets and waterproofs, we went outside to meet the horses. She tried to pair us up according to experience and comfort. 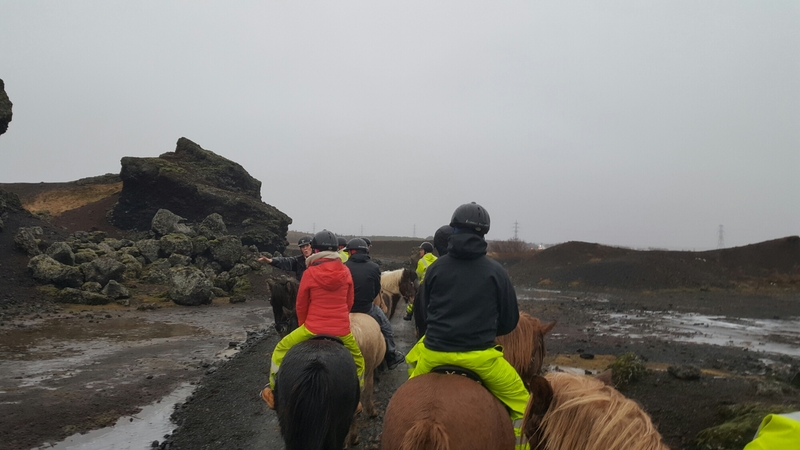 Claire, as an experienced rider, got Stjörnudis (Star Lady), a very pushy horse who always wanted to be in front, tour guides be damned. 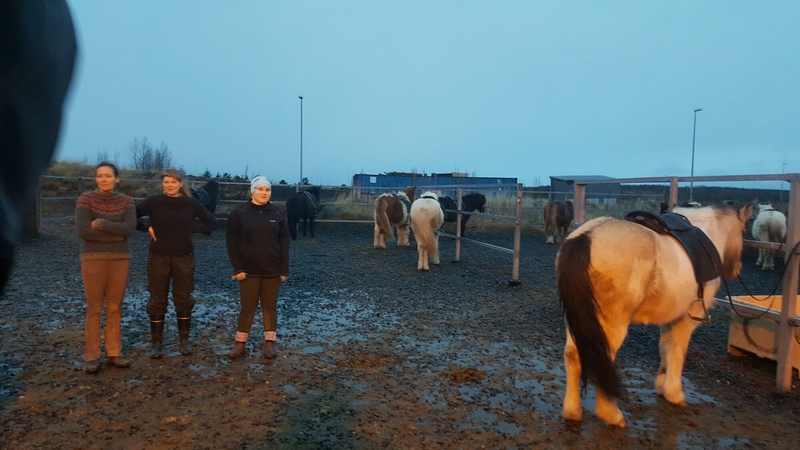 One by one we were sent to our horses, each rider trying their best to work their mouths around the Icelandic names. I got flashbacks to kickball in gym class when I was left for last, and Begga directed me to Agði (Agatha). She turned out to be a very new addition to the farm, and she was spirited and eager to get going. Much like myself she got restless whenever we stopped, though I don’t usually stamp my feet. They warned me about her personality and I was happy they thought I could handle her. The ride was an hour and a half loop through what looked like an alien planet. 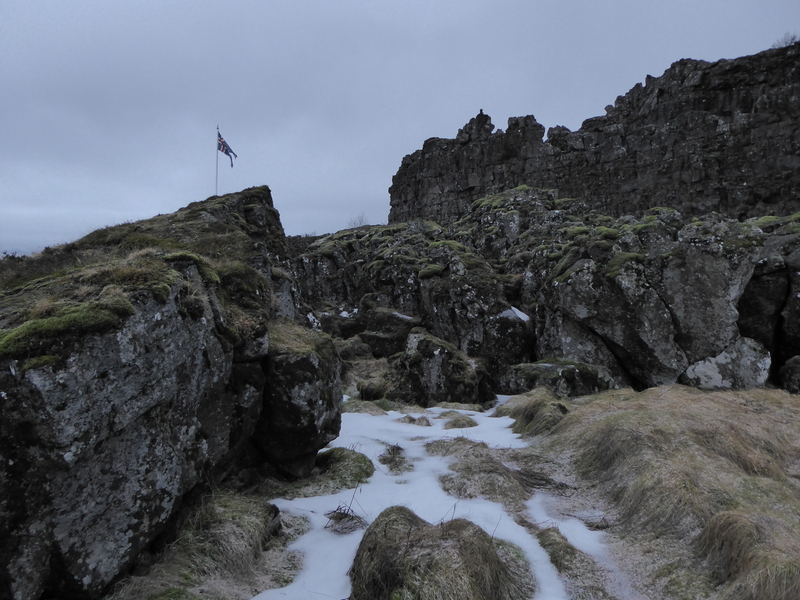 Jagged rocks covered in moss burst through black soil, punctuated by the occasional small pond or patch of old snow. Begga told us that these types of craters only exist here and on Mars, so if we ever had the chance to go to Mars we shouldn’t bother. I was enjoying myself too much to notice at first, but the closer we got to the stables the more I realized how wet and cold I was. My toes were completely numb and my fingers were stiff from the cold. I was wearing 5 layers and 2 pairs of socks underneath my waterproof gear, but no waterproof gear could keep someone dry in nearly 2 hours of sideways rain. The discomfort was completely worth it, though. 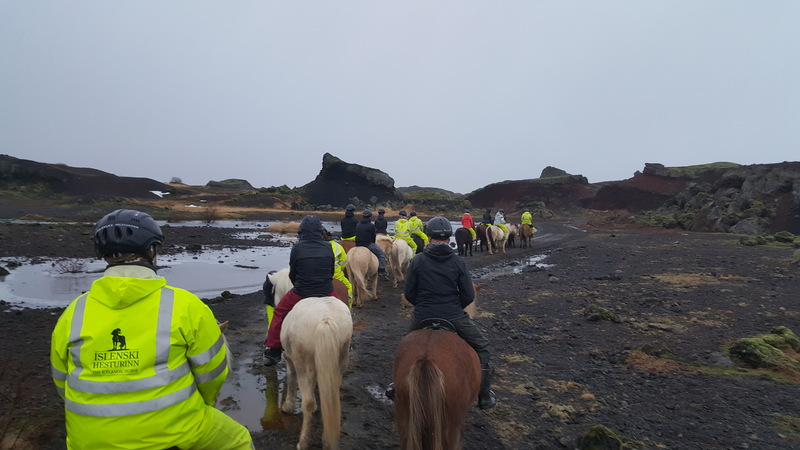 After peeling off all our wet jackets and pants and helmets we warmed up a little in the stables then went back to the hotel to get ready for our next trip: the Blue Lagoon! 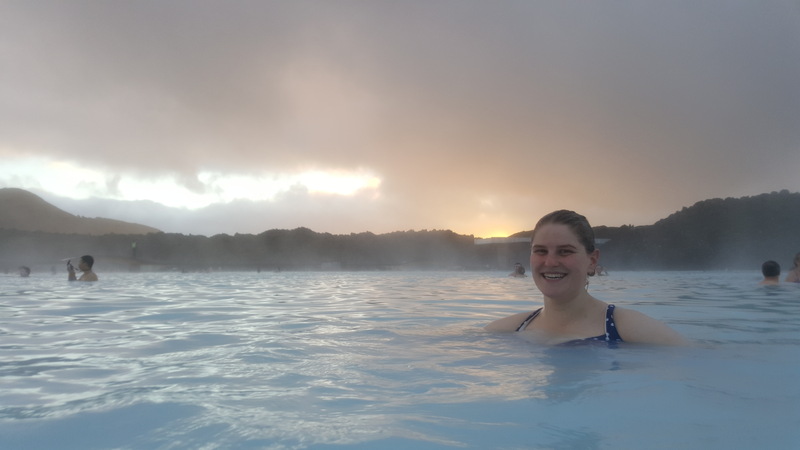 We were sore and tired from riding and an afternoon soaking in geothermal pools was exactly what we needed. A 45-minute bus ride later we saw tufts of steam floating in the air and we knew we were there. We had paid a little extra for the “premium” experience and it was worth it to have robes and slippers waiting for us… plus a couple free drinks at the fancy restaurant and swim-up bar. We spent a couple hours wading in the warm blue water — the natural silica deposits make it that color. 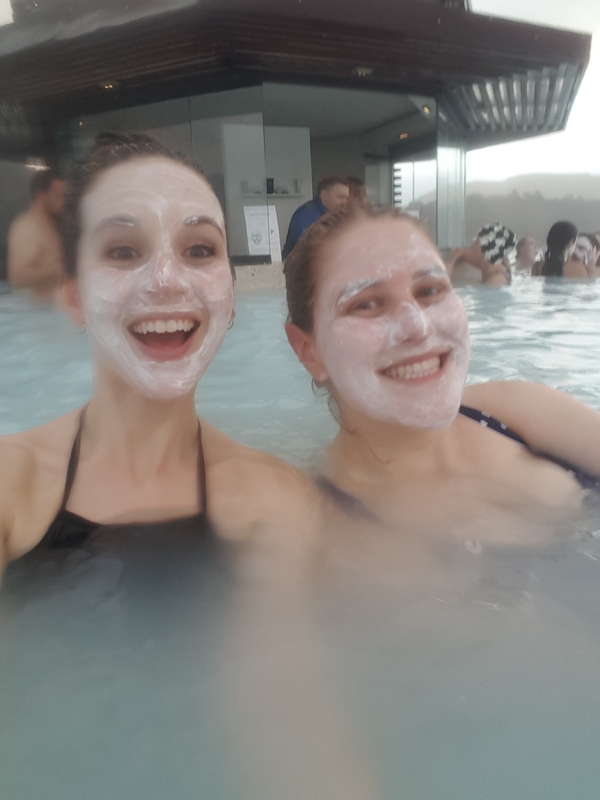 We also took advantage of the free mud and algae masks! 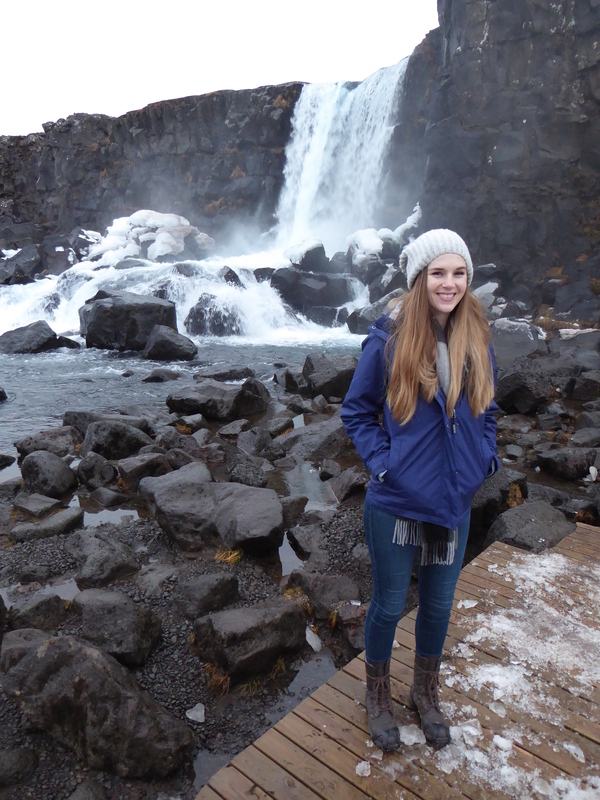 Warm and squeaky clean, we went back to the hotel to rest before our last day in Iceland, and our biggest tour yet! 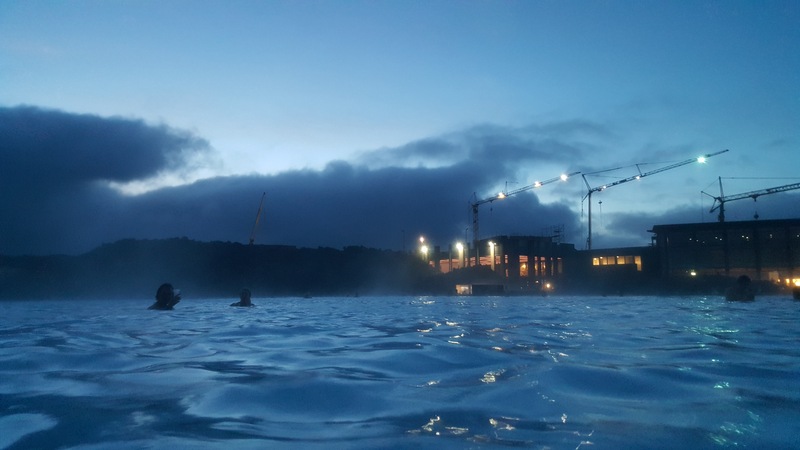 ​The weather report said Iceland would be warmer than Scotland. We shouldn’t have listened to it. It completely failed to take into account the wind, which turned a wet grey winter day into a freezing hell of icy rain that sliced right through you. The wind chill was well below freezing and made my nose and cheeks ache. 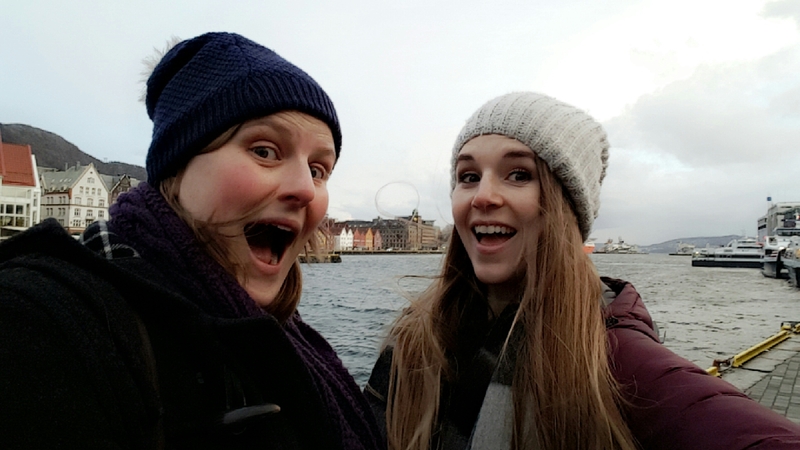 Claire and I set off in our exploration of Reykjavik after our plane landed early in the afternoon and pushed ourselves to see as much as we could despite the weather. 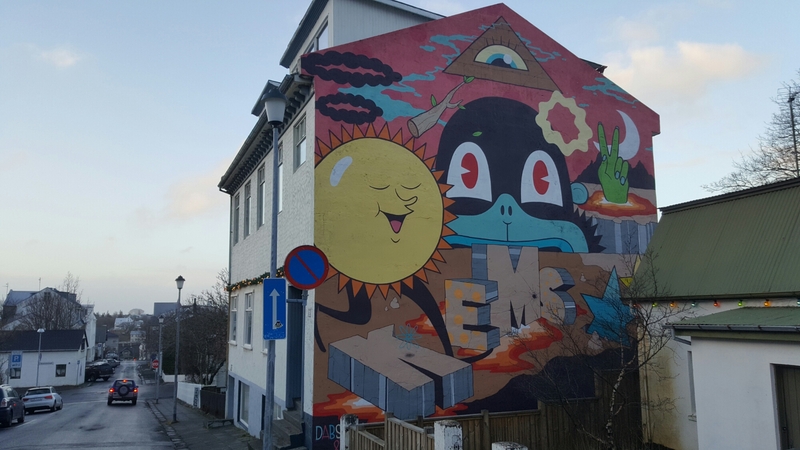 Although Reykjavik is small, with just over 100,000 inhabitants, it’s certainly not pedestrian-friendly. We constantly ran into missing sidewalks or four lanes of traffic you have to run across with no signal. Plus the enormous puddles everywhere! 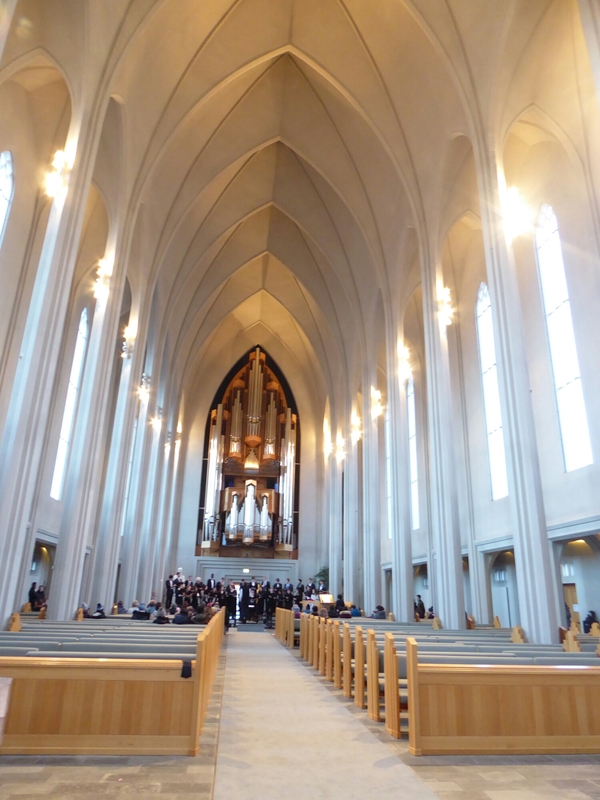 Our shoes were dampened but our spirits were not and we started at the unique and impressive Hallgrimskirkja. The church was built in the 1920s so it looks incredibly modern and Metropolis-like. The Harvard choir were performing that night but as we walked around the church we got a free preview as they rehearsed. For a small fee you can take the elevator to the top (no stairs, sadly!) 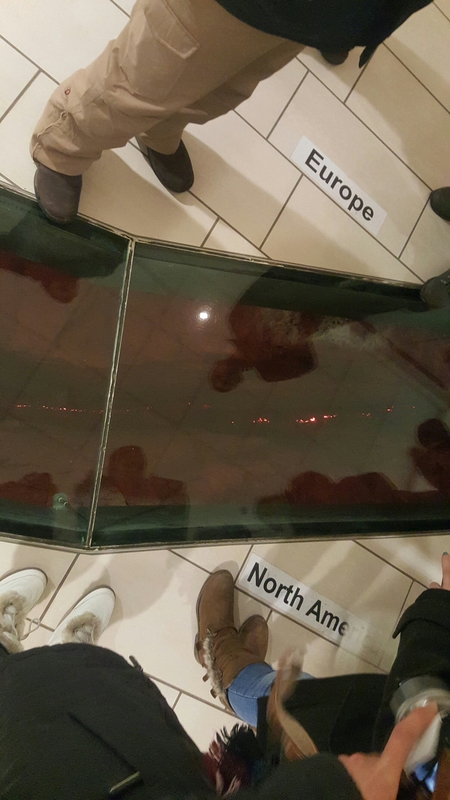 to see Reykjavik spread out below you. When I stood on the steps by the windows to look over the city, the wind pushed me back with a fierceness, so I stayed next to the walls and peered over instead. Outside the church is a statue of Lief Ericsson, a gift from America. 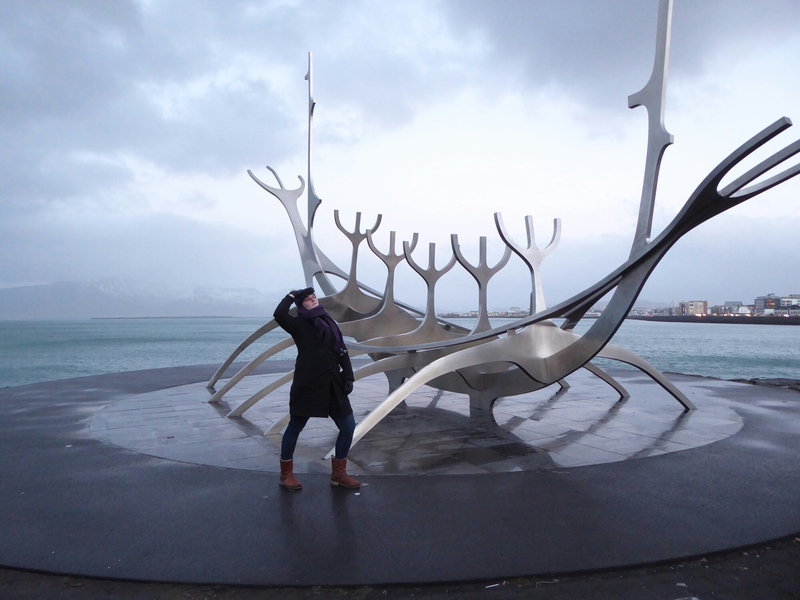 We walked down to the harbor to see another Viking artwork, the Sun Voyager. 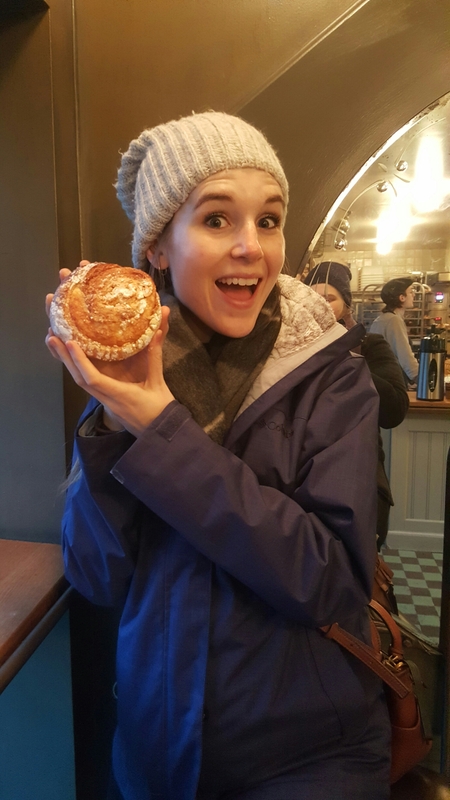 On the way we discovered a bakery that sold my true love: cinnamon rolls! Still warm from the oven, they rivaled the ones we enjoyed in Norway. As it grew dark we walked along the main shopping street. The minibus picked us up at the hotel that night for the northern lights tour. As our guide said, catching the northern lights requires many factors all working together — a clear sky, solar activity, the right time of year, and luck. 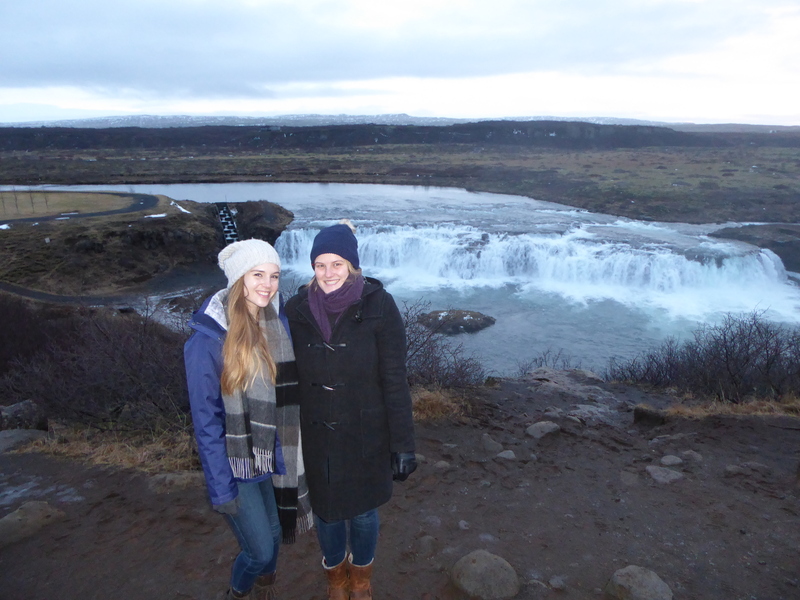 Our guide was an older Icelandic gentleman and I loved hearing him pronounce the place names as we whizzed by. 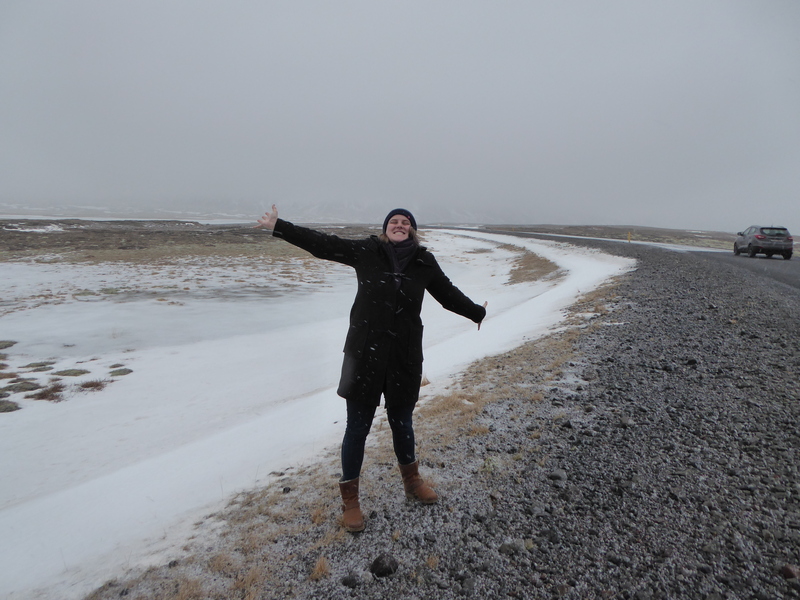 Icelandic sounds like birds talking, all sing-song trills and rolled Rs. Unfortunately the weather still wasn’t cooperating with us. Whenever we stopped the clouds would quickly cover the sky, and the wind was so strong it squeezed in the sides of the minibus and loudly slammed the door. Despite my layers my teeth started chattering the moment I stepped outside into the freezing gusts. Our guide and the other guests kept us entertained while we waited on the bus for the clouds to part. One woman didn’t seem to understand … well, anything. “Is it clear outside yet?” she asked as rain pounded the roof. When the guide explained that we were having difficulty seeing anything because of the clouds, she stated matter-of-factly that it wasn’t the CLOUDS that were the problem, it was the LIGHTS. Huddled in the relative warmth of the minibus, our guide passed the time telling us traditional Icelandic folk tales of elves and trolls. A familiar voice kept interrupting. “Yes, but HOW did the elves warn the farmers?” Exhausted and cold, we finally had to call it a night. We feel asleep during the drive back and finally crawled into bed at the hotel at 1 in the morning. We were disappointed not to have seen the lights, but it was an interesting experience anyway. 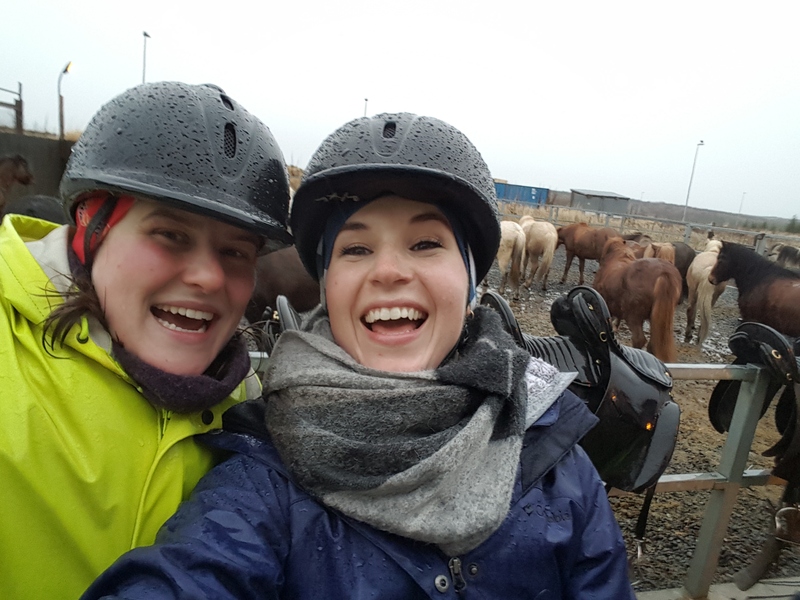 After a few meager hours of sleep we were up in the morning to get breakfast before our next tour — riding Icelandic horses across the volcanic craters! It’s been go-go-go since we arrived! We got in from one tour at 1am last night, then got picked up for another tour at 845am, now we’re leaving in 15 minutes for another trip! I’ll just put up a couple photos for now, hopefully I’ll have time for a big update later tonight. 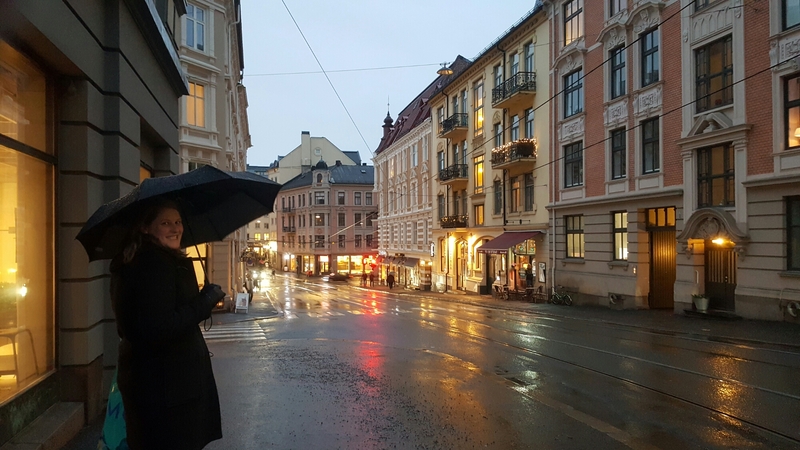 Despite the constant cold rain, Claire and I had really enjoyed our time in Norway. However, the weather did put a bit of a damper on some of our plans, and we always came home cold, wet and exhausted. 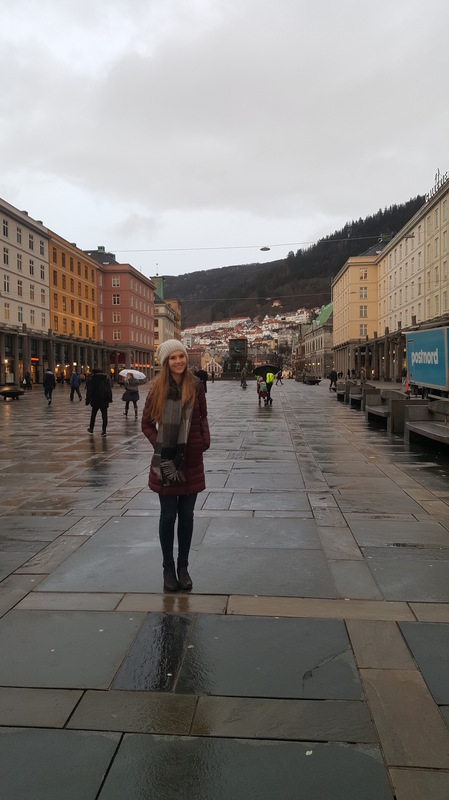 On Thursday we woke up and lingered over breakfast, unsure of what to do with our last day in Bergen. It didn’t get light until 10am and even the locals were hesitant to go outside. We trooped on, though, hoping to find some inspiration in town. Unfortunately, the most exciting thing happening in Bergen was a little boat in the harbour cleaning up trash. Really. It had attracted a crowd of onlookers who were snapping photos of the dramatic scene. Then we tried killing some time at a cafe, but it was STILL closed. Clearly we needed to make our own fun here. 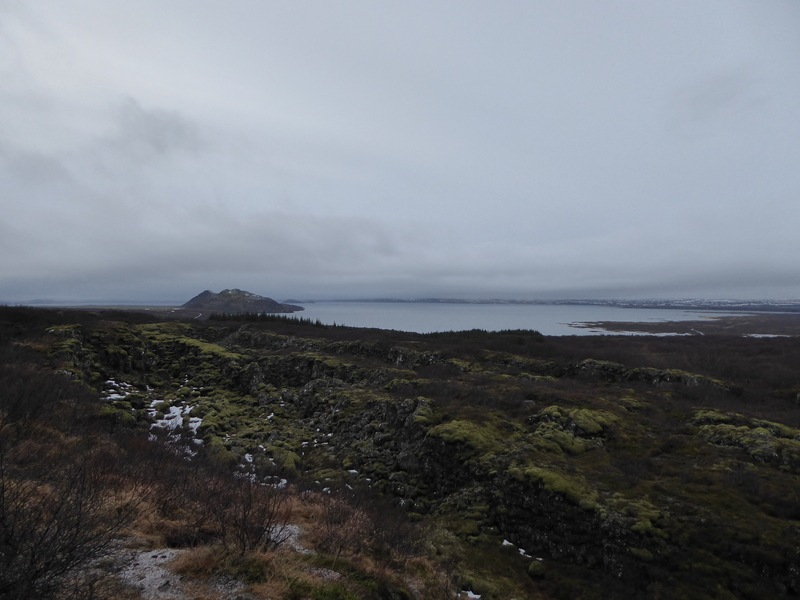 The one thing I really wanted to do seemed to be the one thing that we couldn’t do in the rain: hiking to the top of Mt Fløyen. There is a little funicular train that runs to the top every 15 minutes, and I was resigned to just doing that. But once we got to the station Claire and I exchanged a look, and we both had the same thought: Screw the weather, let’s hike this mountain! After a gruelling Chutes-and-Ladders-esque climb up several ramps and flights of stairs, the mountain trail properly started. The trees protected us from the worst of the rain and our umbrellas did the rest of the work. The view was already spectacular, and I enjoyed the deep hush of the evergreen forest. The only sounds were the crunch of our boots and the little rushing brooks that had sprung up after the rain. Suddenly, the raindrops began to sting my face. I caught one in my hand and realized it wasn’t rain at all, but snow! This was the Norway I dreamt of! 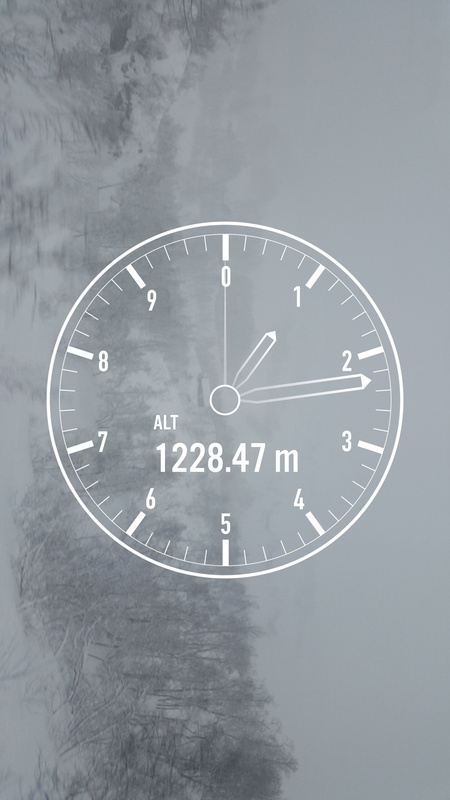 As we climbed higher, the snow turned from hard icy pellets to big fat flakes. Claire and I were ecstatic. The snow obscured the view but we didn’t care. As Australians we were thrilled to be out in a real live snow storm! We reached the top in just under an hour, and the snow cleared away just in time for us to see Bergen spread out below us. Adding to the dreamlike atmosphere at the snowy peak were hulking wooden pieces of playground equipment, a statue of a troll (“Fee-fie-fo-fum, I smell the blood of a Christian man!”) and a sign I was clearly disobeying. We happily skipped back down the mountain in less than thirty minutes, and rewarded ourselves for our adventure with homemade apple cake and cinnamon rolls (that we waited another half hour to get fresh from the oven). 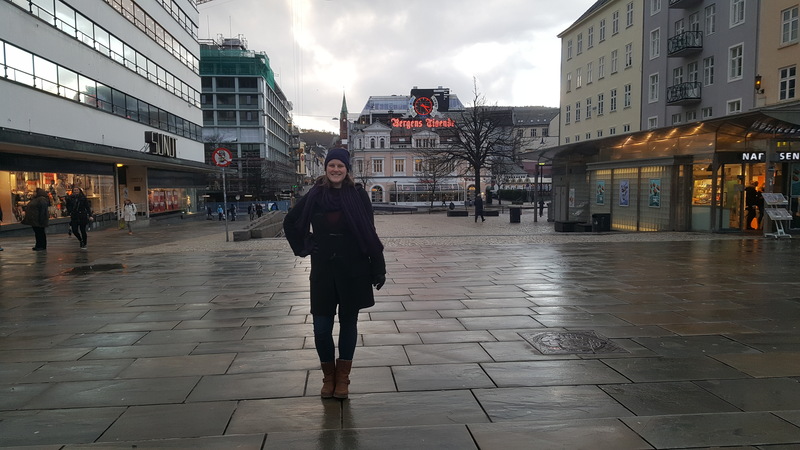 Claire and I were thrilled with our morning in Bergen and didn’t much care what else we did in town. We felt like we’d had a very successful trip. After wandering a bit and enjoying some Norwegian cheese we went to the airport and headed back to Edinburgh. 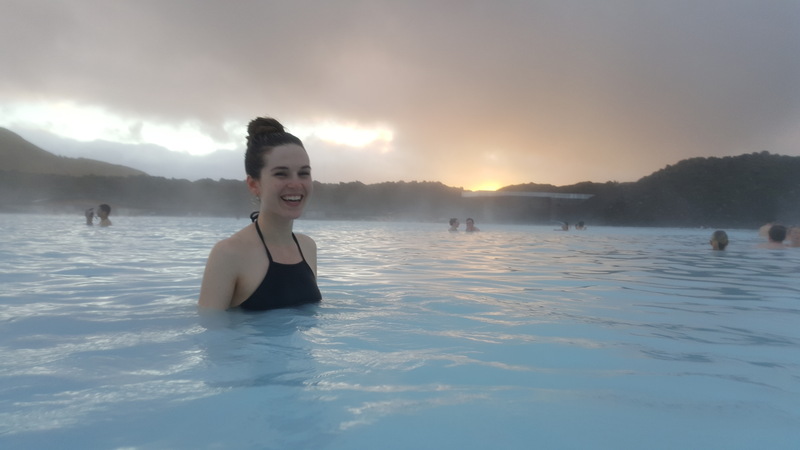 I have a little time here to relax and get ready for our next holiday: Iceland! ​One of our favorite parts of this trip is that everyone, EVERYONE thinks we’re Norwegian. It must be the blonde hair. We are always addressed in Norwegian, and we feel slightly ashamed answering in English. We can get away with the charade for a few minutes, as “hej” (hey) is “hello” in Norwegian and nodding is universal. It’s nice to be treated like a local when on holiday. Even in other European cities like Paris or Barcelona we still clearly reek of foreignness and they don’t even bother speaking French or Spanish to us. 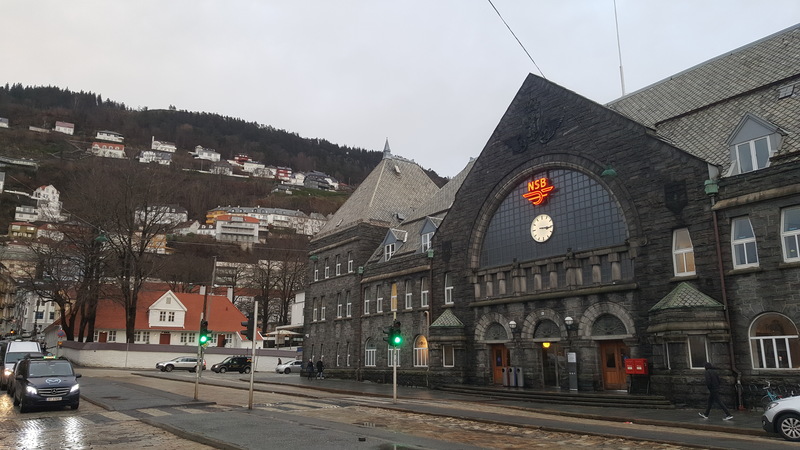 Yesterday morning after another incredible breakfast at the hotel (where the maître d’ thought we were Norwegian), we checked out (where the guy at the reception desk thought we were Norwegian), and got on our train (where the ticket inspector thought we were Norwegian). 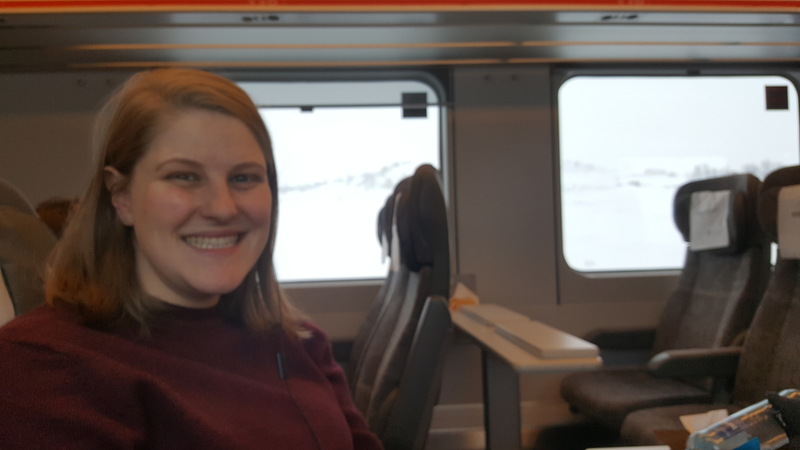 We settled in for the 6 and a half hour trip to Bergen. Norway tries to encourage eco-friendly behavior, something Claire and I find laughable considering the lava-hot temperature of the hotel rooms and the lights everywhere that never seem to turn off. Anyway, because of this, the train is heavily subsidized and even the first class tickets were extraordinarily cheap. Our carriage at the front of the train was comfortable and quiet, and we had so much leg room I couldn’t even touch the seat in front of me with my toes. 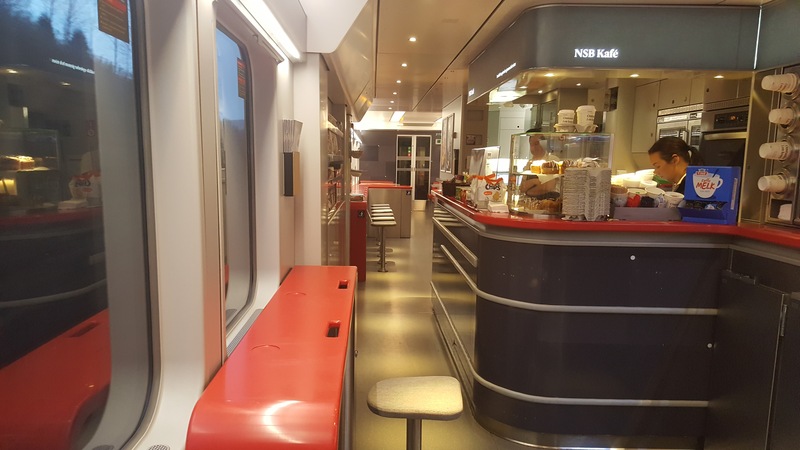 There was unlimited tea, coffee, and (to Claire’s delight) hot chocolate, along with free wifi and electric outlets for every seat. Elsewhere on the train were a cafe car and a family car, complete with a tiny enclosed jungle gym. I made several passes up and down the train, and enjoyed watching the tracks disappear behind us from the caboose window. 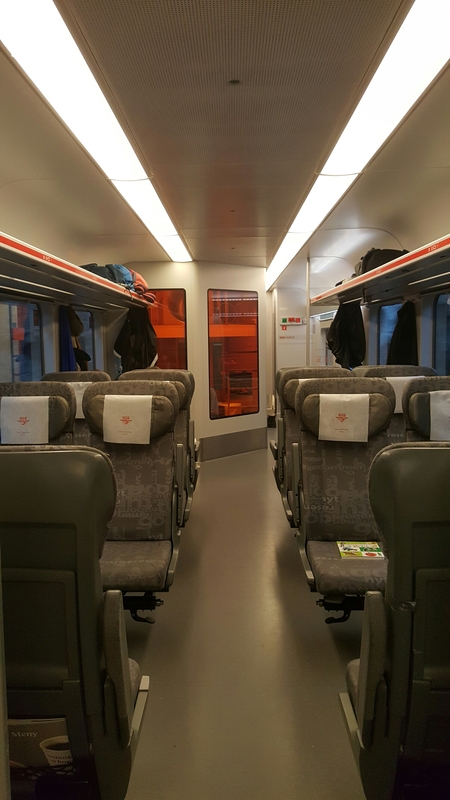 Norwegians are notably reserved and quiet, and the train was no exception. Even if you’re in their way they will stand impatiently, maybe grunt, then just push past. The silence was fine by me, and I watched the scenery pass while listening to music and podcasts. It’s not that they’re not friendly, though. Everyone greets you with a smile, and a conductor lounging in the cafe joked with me about juggling the apples I bought (which I dutifully demonstrated for him). 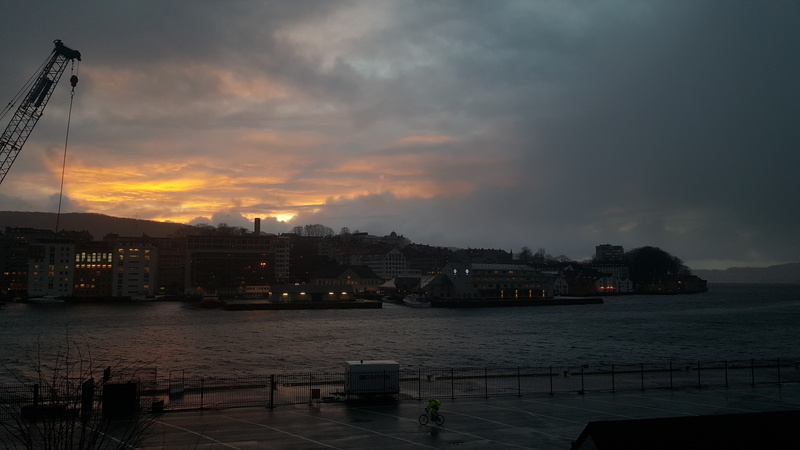 The journey went from Oslo in the east to Bergen on the west coast. 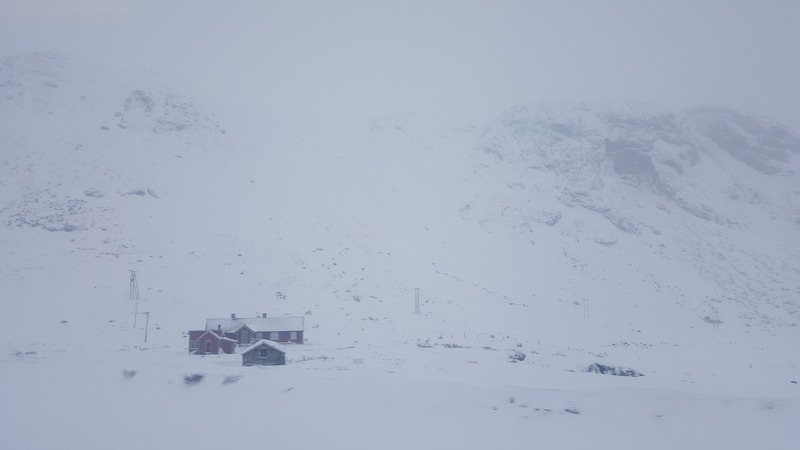 The train is famous for being high in the Norwegian mountains –the train seemed to endlessly zig and zag, which made the altitude climb almost imperceptible. You could definitely feel the tunnels, though, even in the pitch black morning. Our ears popped uncomfortably a few times every hour. I had been looking forward to the train trip for weeks, and it lived up to expectations. 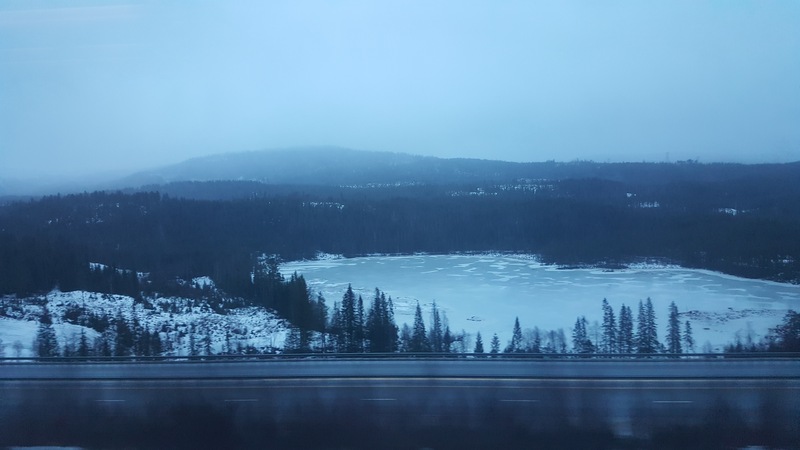 The landscape changed from hour to hour: lush and green, then enormous dark lakes; craggy black mountains then little multicolored ski towns; complete snowy white-outs then deep blue rivers rushing through holes in the ice. The tracks passed so close to the sheer rocky faces of the mountains I thought the paint would be scraped off. 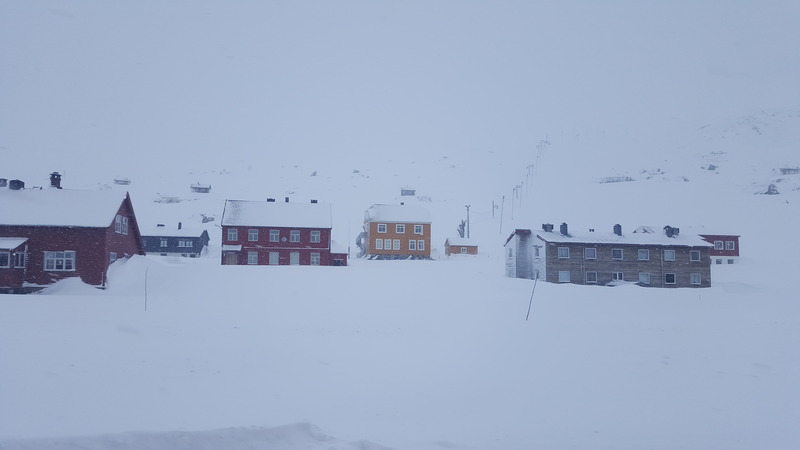 The tracks were at times over a kilometre in the air, and I was treated to brief glimpses of trees and houses deep in the snow-blanketed valleys below. Just as my eyes adjusted to the perspective, we would enter another tunnel and emerge into a completely different view. As I walked up and down the train, snowflakes would sneak into the spaces between carriages. It helped remind me this wasn’t a film or a Disneyworld ride. 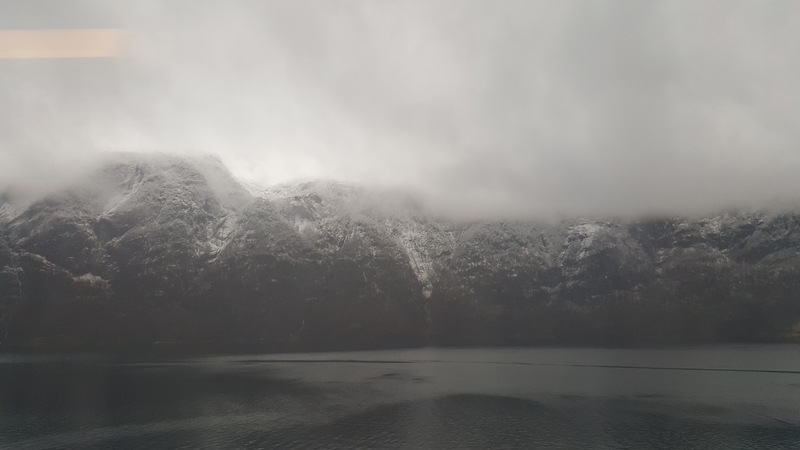 As we got closer to Bergen, suddenly the snow disappeared and the train rounded through the misty fjords. At least I think they’re fjords. I’ve always heard of them but never really seen them. 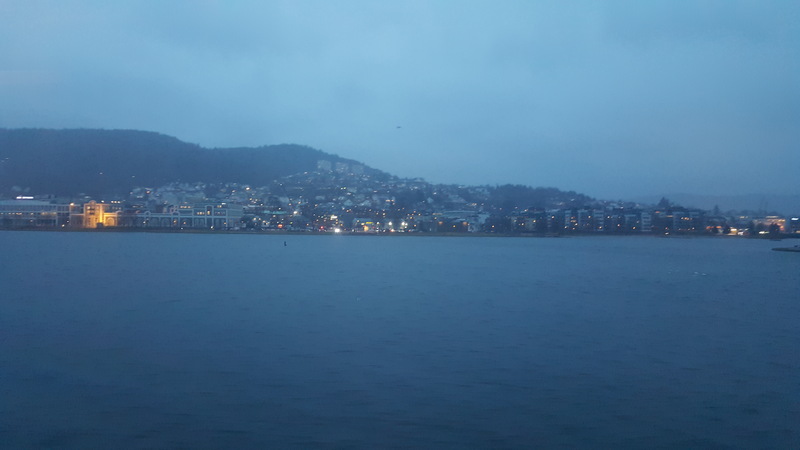 Bergen has the reputation of being “Gateway to the Fjords,” so I reckon it’s a safe assumption. Just as we got to the historic side of the city it started to pour. We scrambled up the muddy ramparts at the old castle to catch the sunset, then ran through the freezing rain to the military museum. 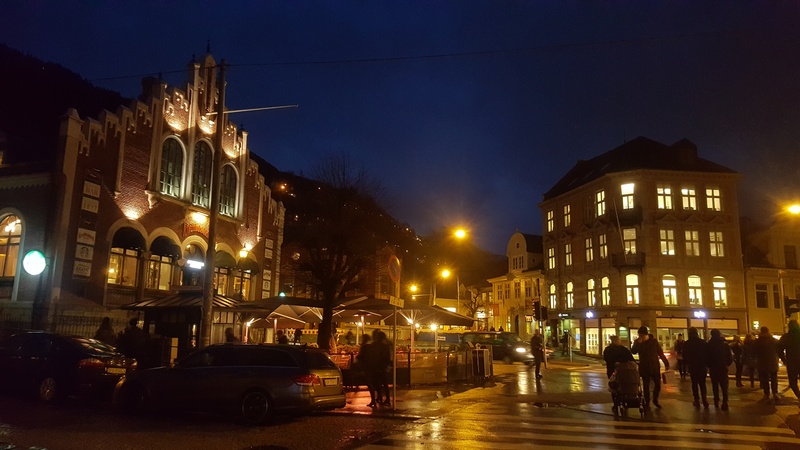 As our jackets dried off in the hallway we skimmed through the modern and medieval history of Bergen to focus on its importance as a centre for the Norwegian resistance during WWII. The locals were sure that the British would come to the rescue soon after the Nazis arrived, but days turned into months and then years. I had read a little about Quisling, a puppet Norwegian leader so reviled his name is now an insult, like Benedict Arnold. 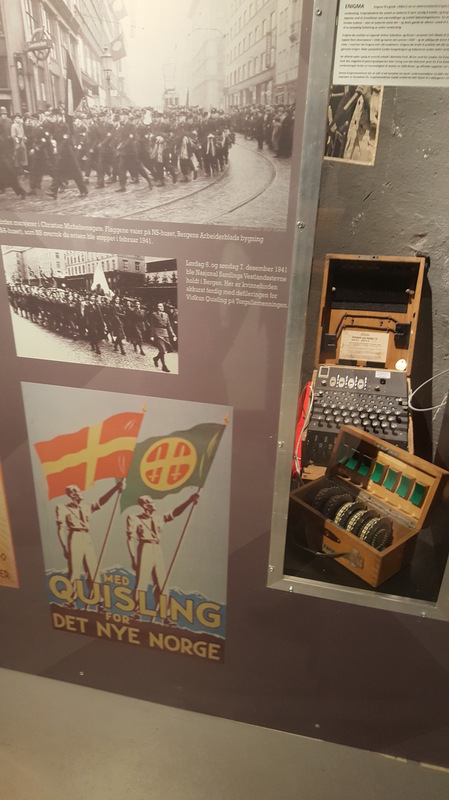 They had more about the individual efforts of resistance members, as well as some interesting artifacts like a real Enigma machine. They also had a bit about a Dutch ship carrying German explosives that “accidentally” exploded in Bergen’s harbor in 1944. Claire and I were unconvinced. Starving, we left the museum in search of food. 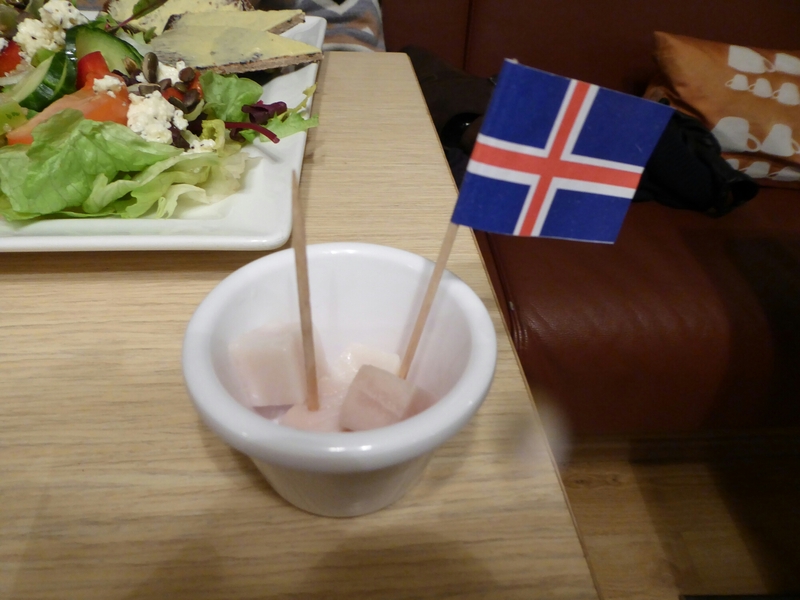 Any adventurous notions of trying lutefisk or other Norwegian delicacies had disappeared. I just wanted something comforting and warm, and gelatinous lye fish wasn’t that. 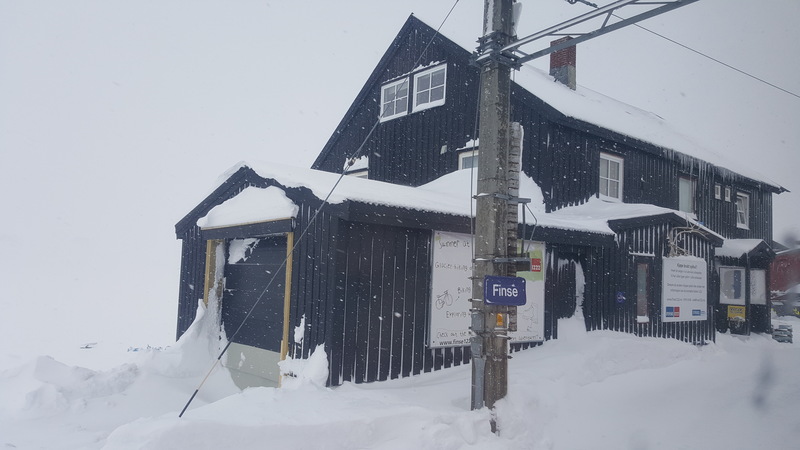 We ended up at a cute little cafe for dinner, but our search for dessert was foiled by Norway’s completely incomprehensible winter opening hours. We spent our evening curled up in the hotel room with some sweets from the local supermarket and fell asleep. We’re at breakfast now and getting ready for our last day in Norway! 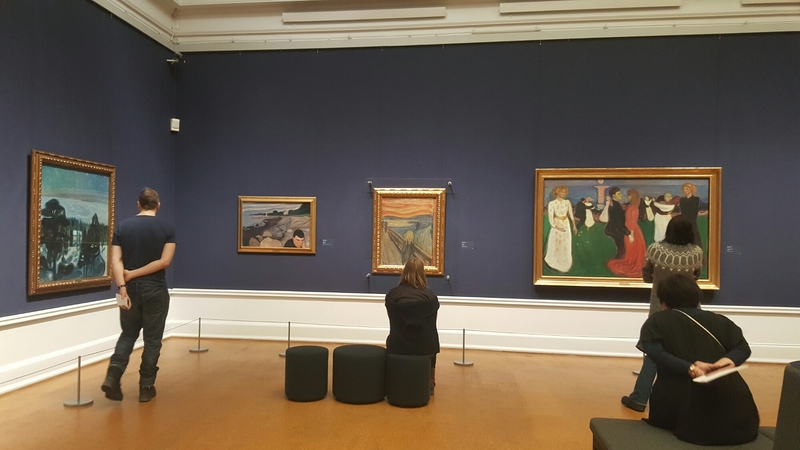 ​After our enormous and leisurely breakfast (it’s hard to motivate yourself to leave the hotel before 10am when it’s still fairly dark outside), we went to the National Gallery. 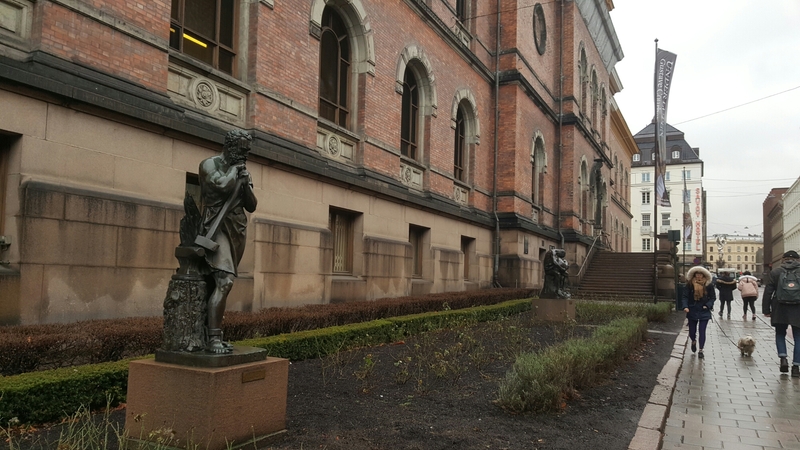 It had been organized by era, and kindly pointed you to gallery 1 with a large sign saying “Start Here!” We zipped through the ancient Greeks to get to the Norwegian art. It was fascinating to see landscapes that looked wholly foreign to us — glittering lakes under enormous mountains, moonrises over snowy peaks, and of course fjords galore. Having gotten into painting myself recently, I was even more impressed by these. 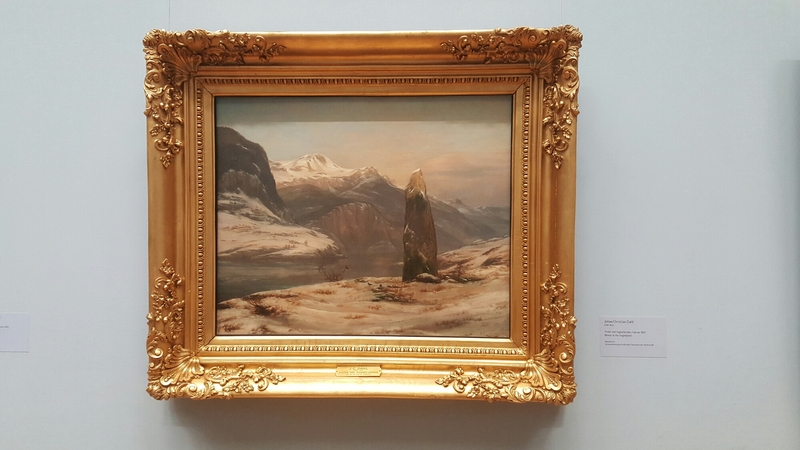 One artist painted dozens of scenes of sunrises, sunsets, storms and even waterspouts. To get the particular natural light just right, you’d have to fix the scene perfectly in your mind, or make a quick prepararory painting in a matter of minutes. I have the luxury of being able to stare at photos on a computer screen for as long as I want. If course the main draw was Edvard Munch’s “The Scream.” I always assumed that the pale yellow was just faded paint, but looking at it up close it’s just the canvas itself showing through. It looks only half-finished, with scratches of pastel on top of the swirling paint. Claire was unimpressed. 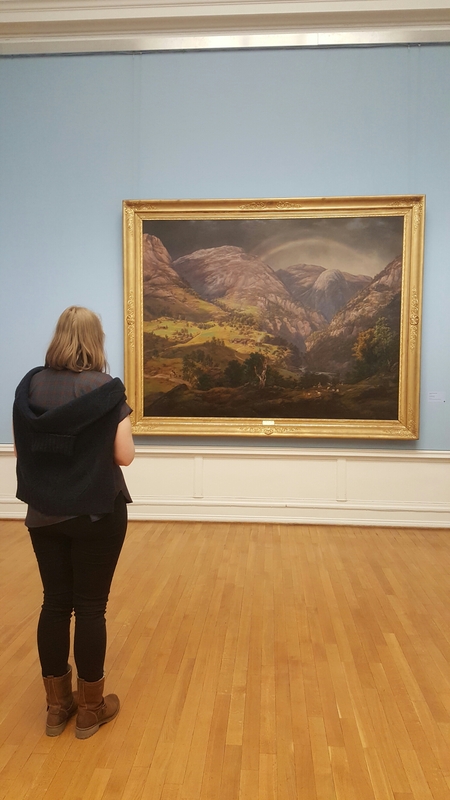 It was interesting to see his other pieces in the room and take in his clearly gloomy, curving aesthetic. 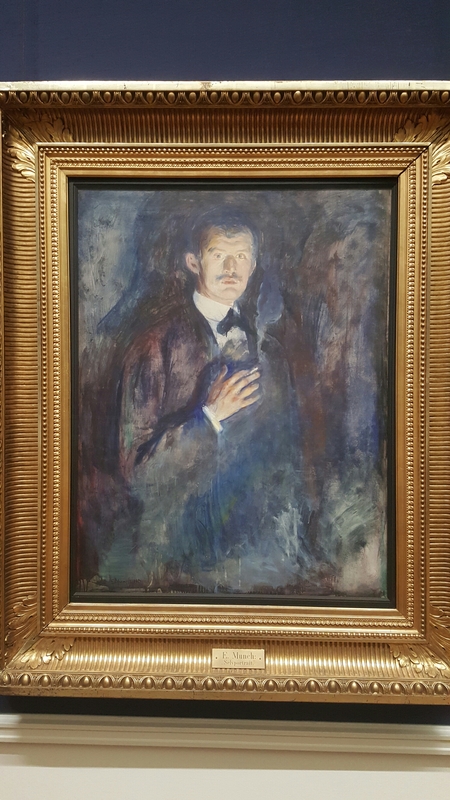 His self-portrait was my favorite. His resemblance to Vincent Price explained why his art felt so spooky. Warm and ready for more of Oslo, Claire and I continued up the main shopping avenue. It began to sprinkle snow and rain which made the shops even more attractive, and we ducked into a few. (We also had another incredible cinnamon roll. I’m going to miss those.) A couple years ago I went to a jewelry store in Stockholm called Edblad, and I wore the necklaces I bought there nearly every day since. I was thrilled to find out they had just opened their first store outside of Sweden and I dragged Claire inside to pick out a few new pieces. Afterwards I promised my bank account I wouldn’t buy anything else on the trip. 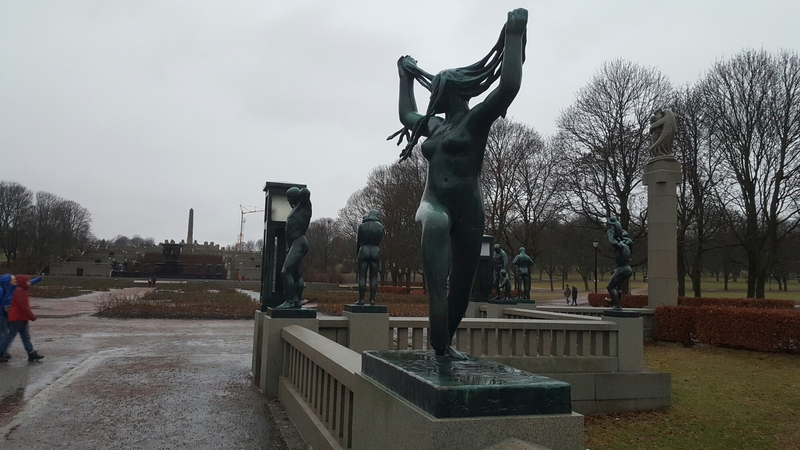 At the top of Bogstadveien was our next artistic destination, Vigelandsparken, or Vigeland’s Park. 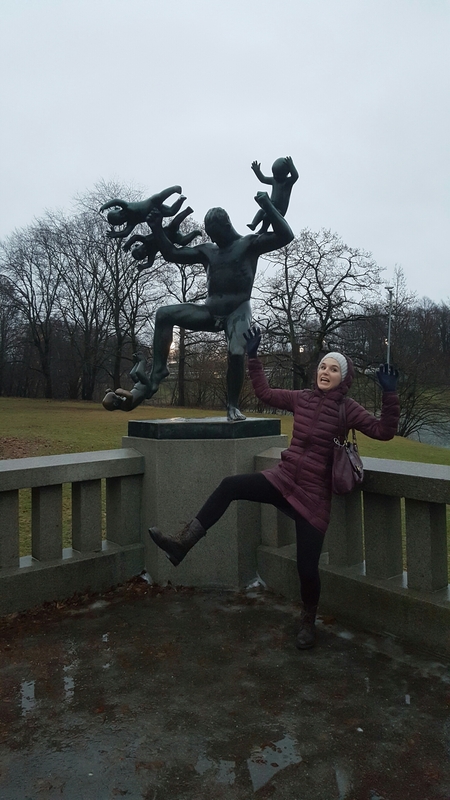 Vigeland was a Norwegian sculptor who specialized in bronze statues of people in … unusual poses. Even in the dark and the rain the sculptures were both impressive and hilarious. The sun was setting and the rain was really coming down, so we walked as quickly as we could into the city. We soon learned to stay as far from traffic as possible when a passing car splashed freezing water all over our legs, but the brisk walk kept us warm. 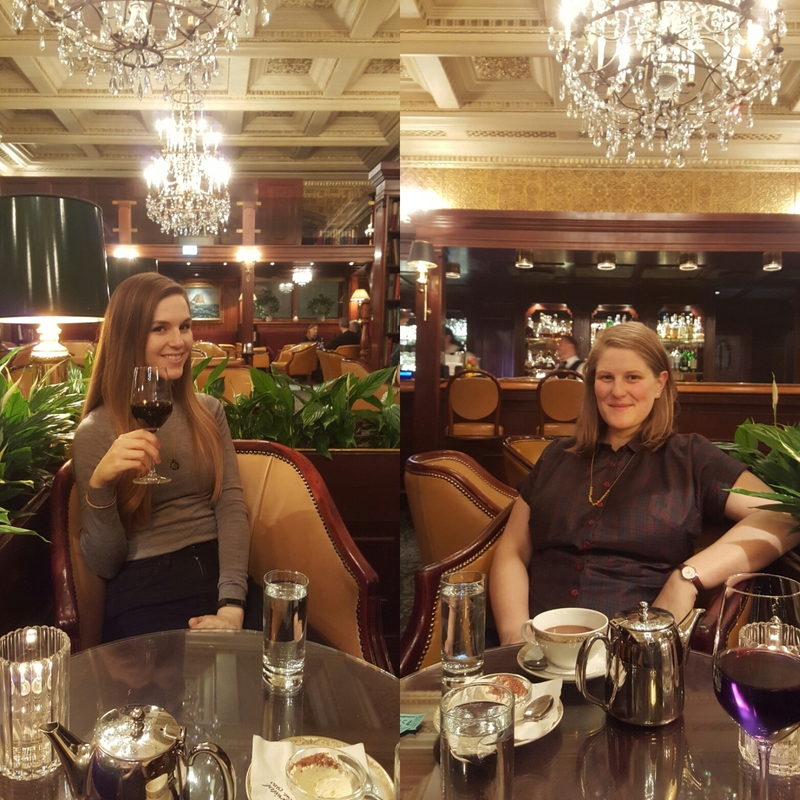 We stopped in the grand old Library Bar at the Bristol Hotel to warm up, where a man in a tuxedo was eating dinner and making us feel under dressed. We tried walking around the shopping centre but we were too tired and hungry (from another 9 and a half miles of walking), so we just stopped by a local pub for surprisingly delicious pizza and went back to the hotel for an early night. We’re at breakfast again as I write, getting ready to head to the train station across the street to go to our next destination: Bergen!